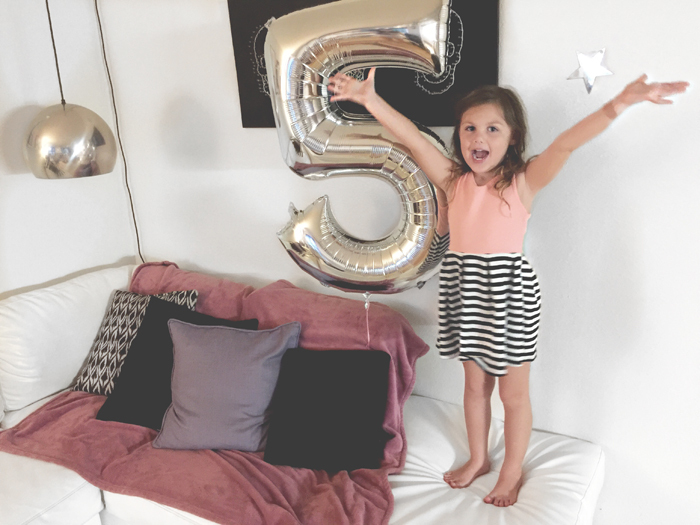 Now, I’m 15 days late with this post but I just had to have it on the blog so that I can look back on it later down the road of life..
Our baby bird is 5 years old and we couldn’t be prouder of the little lady she has become. Of course there’s sass and boundary testing and tantrums like any other kid in the history of the world but beyond that there is love and tenderness and hilarity... seriously she is so funny. She’s also very big on affection, like her parents, and it is given freely and often. Some of her current favorite things are to play with her my little ponies, particularly in water (pretending they’re swimming at the pool is at the top of her list), Shopkins, playing Uno and beating her mama at most games, having tea parties, “Mouse” or “Mousy" who is a light pink stuffed animal mouse that we bought her when she was little and goes with her everywhere, pepperoni pizza, the color pink, she prefers her hair down, playing with makeup (especially lipstick), our rabbit Alfie aka "her little brother”, she prefers watching YouTube videos over cartoons and prefers Disney shows with kid actors over cartoons as well, baking with Mama and going to the “choo choo mall” (she calls it that because there’s a train that you can ride there), getting an Icee, going to the bounce house place and then looking at shoes afterward.. Her least favorite things are when I brush her hair, when I sing super loud all day long and generally annoy her (which is most of the time), the thought of going to the doctor or dentist, getting a boo boo and having to see it.. even the smallest scrape freaks her out and she has to put a bandaid on to cover it so she can’t see it, having to get out of bed for school on rainy cozy mornings, when I try to style her hair any other way than down or in a ponytail/pigtails and when Papa has to work late or on Saturdays. She’s full of life and personality and brings us more joy than we could have ever expected. Yes, parenting is a hard journey sometimes just like anything else in life but the cliches are still true.. and I am 100% that parent who agrees it’s worth every bit of strife to hear those giggles and “I love you Mama’s” and to get those full, no holds barred hugs. So happy birthday again, Rowan. We are forever thankful for you.